RIFT VALLEY, Kenya , Aug 10 2011 (IPS) - The Mawingu camp for internally displaced persons affected by Kenya’s 2007- 2008 post-election violence is a desolate place. 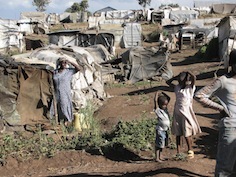 Located in the Rift Valley, the camp is a collection of tattered, sagging and forlorn tents. Save for the 120 children crammed in a room shouting in unison during an English lesson, there is no other sign of life. Many of those who live here left early in the morning to look for menial jobs. If they are lucky they will earn Shs 100 (one dollar) for a day’s work. In the middle of the haphazardly erected tents that provide shelter from the vagaries of the weather stands a frayed, faded tent. Initially there is a deafening silence. But then Truphosa Achudo, the owner of the tent, emerges with her hands on the scarf wrapped around her head. “I have just taken my drugs, they are strong and I am weak, which is why I am breathing heavily,” says Achudo. Achudo is HIV-positive and she has a two-week-old baby girl, Philomena Wambui. She does not know her daughter’s HIV status. But unlike other lactating mothers, Achudo is not eating fruits and vegetables or even drinking milk to aid with her milk supply. She cannot afford these luxuries. Instead her diet consists of only starchy maize and maize flour, which are donated by government every few months. When the supply runs out, Achudo’s husband, Samwel Njau, has to find casual work in order to buy them food. Njau, whom she tells IPS is suffering from severe flu, left at 7am to look for casual work. But her family is not the only one having a hard time. The living conditions in the camp are deplorable and are taking a toll on HIV-positive people. Food and financial insecurity is rampant; most here only get one meal a day as they rely on government’s relief supply, which comes once every several months. There are 2,300 people in this camp, both children and adults. Many of those who live here were informal traders before the 2007-2008 violence and many did not have their own homes. Instead they lived in rented houses and they have not returned because they still fear recurrent violence. Violence erupted in the country after incumbent President Mwai Kibaki was declared the winner of the presidential election. At the peak of the violence, the United Nations Secretary General’s representative on IDPs estimated that there were between 350,000 and 500,000 internally displaced persons. While government has managed to relocate many IDPs, it has had a problem finding suitable land on which to resettle this community. Also, many have resisted attempts by government to resettle them on arid and semi-arid land. Achudo’s predicament encapsulates the desperate situation characterising life in the camp for HIV- positive people. She was diagnosed with the virus in 2007 and immediately started taking anti- retrovirals (ARVs). She is still on ARVs and, like other HIV-positive people in the camp, she gets the treatment for free at the nearby Olkalou District Hospital. Achudo also has a persistent dry cough. After visiting the Olkalou District Hospital, she was given drugs to treat it. It brings her daily regime of pills to 24 tablets a day. “The drugs are strong, I should be eating well for them to work in the body, but there is no food,” she says. She coughs through the night and she can only pray that it is not a relapse of tuberculosis, which she suffered from early this year. It is an opportunistic disease that affects many HIV/AIDS patients in the camp. She has found some solace in her condition by becoming a member of the camp’s HIV support group Tumaini, which means hope. But general despondency prevails in the camp and among members of the group. The few toilets in the camp are a health hazard as they are full and overflow with human waste. When it rains at night the tents get soaked, offering little protection to those inside. And hygiene is an issue. The HIV-positive women cannot afford sanitary towels, for instance. “We have been denied casual work out there with some employers saying we shall infect their workers and friends. Our colleagues in the camp whisper negatively as we pass by, (the) majority of us are widows and we feel vulnerable,” says Gathoni. Stigma has been a major concern in Kenya for people living with HIV, but this group has decided to be open about their status. Out of the 45 people in the group there are only two men. The youngest in the group is a 17-year-old girl, while the oldest is a 60-year-old. “There are up to 250 HIV-positive people in this camp. (The) women have tried to come out and accept their condition but men have shied away and kept secret their (status), though we know them, we even meet with them at the hospital,” says Gathoni. But Francis Wanderi is one man who has come out and accepted his condition. He says acceptance is equal to prolonging one’s life. Until a home can be found for those living in the camp, the HIV-positive group has banded together to support each other through their challenges.